Introducing the Universal IoT Connector (UIC), the Standardization Group for Embedded Technologies (SGeT) has released the first purely software-related standard ever since its inception six years ago. 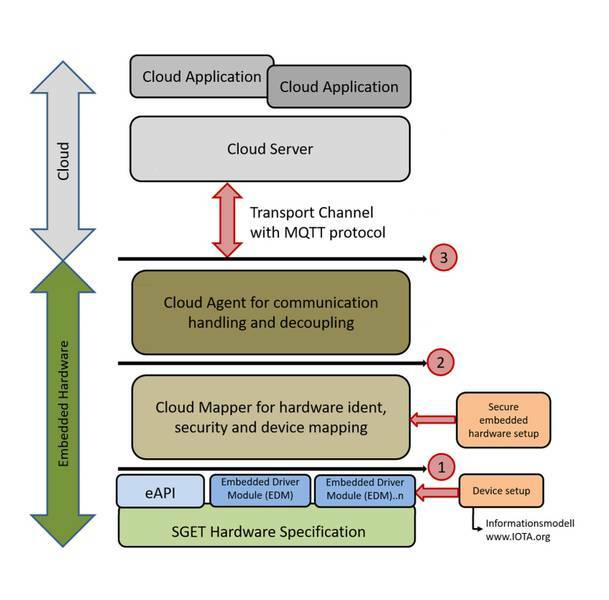 This was preceded by the insight of manufacturers, system vendors and users that a universal IoT connector that standardizes the connection between hardware and cloud is needed for a comprehensive rollout of Internet of Things applications. Previous standardizations often focussed on communication and protection only and thus on the higher software- or communication layers. Or to put it short: where it comes to the application and thus the useful part of IoT solutions. However, data first has to reach the level, where it can be collected, transported and finally processed or stored. Although it is possible to access and control hardware resources such as sensors, actuators or embedded systems through the eAPI for embedded hardware via a defined interface, all hardware I/O communication has to be done manually for each and every edge- and cloud connection until now. When replacing hardware, updating, or even changing manufacturers, many, if not all, customizations need to be made from scratch, possibly for all affected layers, right through to the final application. This is precisely where UIC comes in: The integration of counterparts is made easier by the three levels of abstraction, allowing partitioning of the many aspects of IoT computing. The UIC interface standard makes a distinction between the device configuration device configuration (hardware identification, device mapping, value-to-information matching), the sensor and actuator communication (hardware driver) and the device communication (data transfer & processing). With more than 450 cloud service offerings and an even greater number of possible hardware configurations, this provides a very open, efficient, and hands-on approach to current and future Internet of Things solutions. Specifically, the Universal IoT Connector architecture consists of three interface descriptions: First, the Embedded Driver Module (EDM) interface, which controls the connected hardware peripherals via drivers and provides for sensors, actuators or other local information. The second functional block is the Project Configuration Interface, which provides a configuration mechanism for embedded systems. It regulates which periphery is to be controlled, how raw data is added to information sets and at what point data is going to be transmitted to the server. Last but not least there is the Communication Agent Interface, responsible for transferring information to the communication unit, for example a (cloud) server, which includes sending and receiving of data sets or events. What makes UIC stand out in the field is its open approach to server connectivity (Cloud/Fog/M2M) and its associated infrastructure, as well as to its underlying hardware and vendors – at least as long as EDMs are supported – and last but not least to the level of communication. Depending on the configuration, this allows for connecting to Amazon Web Service (AWS) using a Qseven module and MQTT as well as connecting to Microsoft Azure Cloud via XRCE using a COM Express module. Due to the abstraction, the lean middleware paves the way for a particularly flexible approach. The cross-platform and open approach unifies the access to multiple hardware components from different vendors – such as ADLINK, congatec, Kontron, Portwell or Seco – utilizing a growing number of supported cloud platforms, such as AWS, M2MGO’s People System Things (PST), SAP Hana or Microsoft Azure Cloud using a wide range of protocols (MQTT, XRCE, OPC / UA, etc.). In addition, UIC runs on Windows Embedded and Embedded Linux. SGeT’s UIC standard offers a hands-on, open approach to IoT solutions and Industry 4.0 applications in one of the strongest growth markets, with a forecasted €250 billion by 2020, building on existing structures and maximizing synergies. The multi-level structure supports the ongoing development and the modular approach guarantees a balanced combination of abstraction and ease of use.